A trio of former Googlers try to make Android more work-friendly, with help from a familiar-looking hybrid. 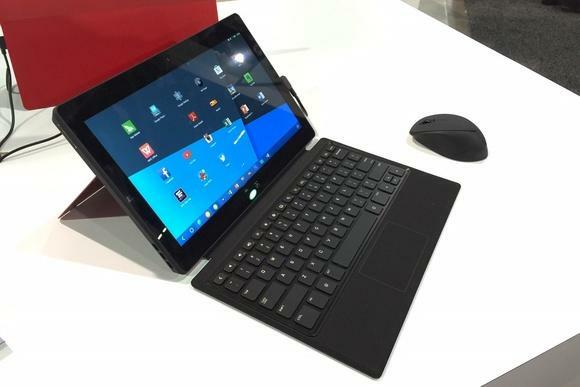 At first glance on the CES show floor, the Remix Ultra-Tablet seems like a cheap Surface knock-off. It has a two-stage kickstand similar to that of the Surface Pro 2--albeit one that feels flimsier than Microsoft's model--and a magnetic keyboard cover with traveling keys and a felt material over the trackpad. But the hardware is mainly a showcase for the Ultra-Tablet's Remix OS software, which isn't merely stock Android. It's a custom Android ROM geared toward productivity, with concepts like windowing, a taskbar, and pop-up menus when you right-click on the trackpad. Jide Technology, the company behind the Ultra-Tablet, is essentially trying to bring back the comforts of Windows without losing the benefits of a mobile operating system. And while it plans to sell its Surface lookalike directly to consumers, the bigger goal is to license its Android ROM to larger device makers. Bridging the gap between tablets and laptops has seemed like the holy grail of computing in recent years. Microsoft hasn't quite nailed it with Windows 8, which doesn't have enough tablet apps and often feels too complex as a mobile operating system. We've also seen some Android laptops and hybrids, but the operating system has never been very accommodating to mouse and trackpad input. If Jide can deliver on its promises, it could finally turn Android into the hybrid OS that Windows never was. Remix and the Ultra Tablet are being spearheaded by three former Google employees, two of whom left the company last year to pursue their vision. Ben Luk spent 10 years with the search giant and worked on Maps, Jeremy Chow left in 2008 after 8 years that included engineering on AdWords, and David Ko worked in Google's advertising business for eight years. Their software is a work in progress, but already has a lot of the things you'd want from a productivity operating system. 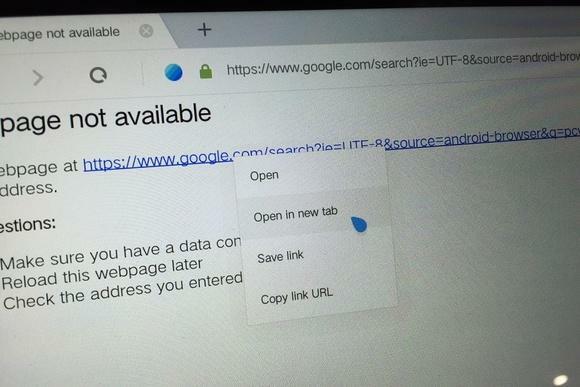 In the Web browser, for instance, you can right-click on a link to bring up a context menu with options like "Open in new tab." Only Remix's own apps support these actions for now, but many Android apps bring up context menus when you long-press on certain buttons or links. Jide is looking at using right-click as a substitute for long-press in these apps, said Ko. You can also run certain apps in smartphone mode, so they take up a small column that you can drag around the screen. But this feature also needs some work, since these apps will overlap anything you have running in full screen mode. Jide is working on a feature similar to the Snap mode in Windows 8 that would let full-screen apps run next to smaller apps without overlap, Ko said. Right-clicking in Remix’s custom apps brings up desktop-style context menus. Jide is also working on more of its own work-centric software. At CES, the company was showing a browser, file manager, email and calendar apps, all of which took advantage of Remix's windowing and right-click features. 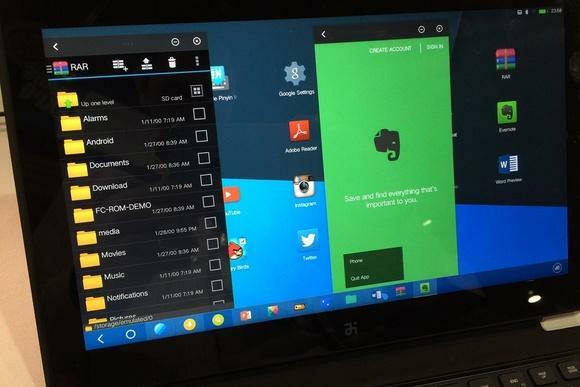 Remix OS lets you run several phone-sized Android apps side-by-side. But when I asked about drag-and-drop functionality, Ko hesitated. "We're not saying we want to go back to the PC world," he said. "We want to embrace the mobile world and add features that make sense for mobile." As for the hardware, the Ultra tablet has an 11.6-inch 1080p display, an Nvidia Tegra 4 processor, 2 GB of RAM, 64 GB of storage, and a MicroSD card slot. It weighs 1.9 pounds and measures 0.37 inches thick. Ko said that Jide will offer the Ultra Tablet through a Kickstarter campaign next month. It'll cost $450 with the keyboard included, and should ship in the second quarter. But again, the real goal for Jide is to get its Remix OS software into other companies' hardware, establishing it as the best option for Android-based productivity. "At heart, we are a software company," Ko said.